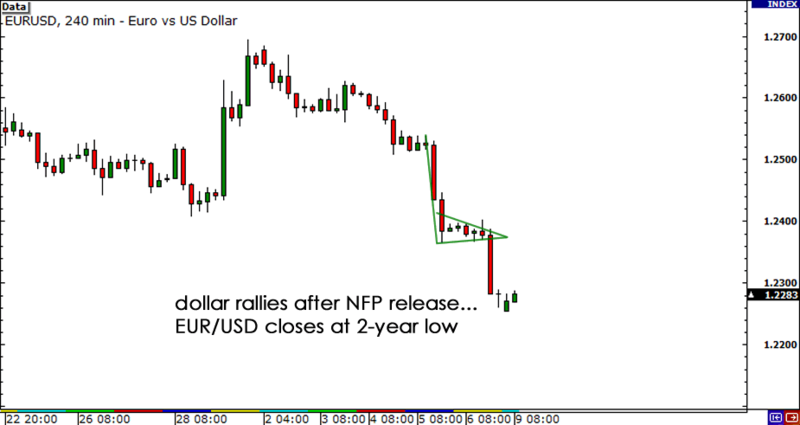 June NFP: Last Straw for the Fed? Last Friday the U.S. nonfarm payrolls (NFP) report inspired ridiculously crazy price action when the headline figure came in at 80,000 for June. Not only did it miss the 100,000 figure that market players were eyeing, but it also marked the fourth consecutive time that the data had disappointed expectations. Heck, even private sector hiring weakened from 105,000 to 84,000! Fortunately for Uncle Sam, May’s NFP numbers were revised from 69,000 to 77,000 and the unemployment rate held steady at 8.2%. Average earnings was also bumped up from 0.2% to 0.3%, while weekly hours rose from 34.4 to 34.5. But a few bits of good news ain’t gonna stop investors from anticipating another round of quantitative easing from the Fed! In fact, some analysts even say that the weak headline figures all but seals the deal for QE3 in the Fed’s next meeting. Recall that in the Fed’s last minutes, Fed President Ben Bernanke himself announced that the central bank would launch more action if economic reports continue to deteriorate. Also, keep in mind that the Fed is under pressure to keep up with its counterparts in actively stimulating the economy. Wasn’t it just last week when we saw the ECB cut its interest rates to record lows, the BOE add 50 billion GBP to its asset purchases and the PBoC launch a triple threat to encourage liquidity? With three major central banks stepping up their game, it may only be a matter of time before the Fed shows off its own guns! Of course, QE3 isn’t a sure thing until the pens are down and the ink is dry. But given the major central banks’ tendency to implement monetary policies hand in hand, anticipating more stimulus from the Fed isn’t such a bad bet. Based on price action last Friday, it was pretty clear that many were waiting for the release of NFP figures before committing to a position. EUR/USD consolidated throughout the Tokyo and London sessions, trading in a mere 30-pip range. Once the report came in worse-than-expected, all hell broke loose, as traders decided to dump the euro and park their assets on the Greenback instead. To be honest, I found the risk-off reaction to be quite interesting. Normally, the prospect of more quantitative easing spells gloom and doom for the domestic currency. Just take a look at what happened to the euro and pound last week before the ECB and BOE interest rate decisions! I think the major concern here is the timing of the central banks. One by one, the major central banks – the ECB, the BOE, and the PBoC – have all made moves to help foster growth in their respective economies. The problem though, is that the markets aren’t convinced that more QE will lead to growth. All they see right now are central banks worried about the state of the global economy! With the Fed expected to make its own moves in the coming months, we could see risk aversion prevail, with the dollar possibly being the biggest beneficiary. This will reveal the discussions being made at the last FOMC meeting and exactly who is pushing for QE3. Ben Bernanke will be sharing the central bank’s outlook on growth, unemployment, and monetary policy to the Senate. Be on the lookout for potential outlook downgrades. This is when the FOMC will decide whether or not to unleash another round of bond purchasing. There you have it folks! Despite us being right smack in the middle of summer, I think we could be in for some exciting times in the forex markets! Be careful out there! Will the Fed introduce QE3 at its next announcement?